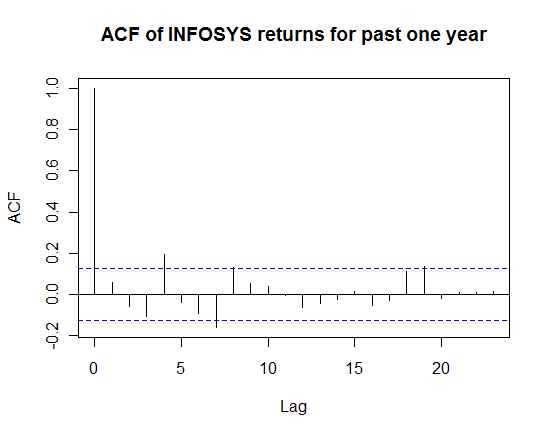 In my previous post, I employed a rather crude and non-parametric approach to see if I could predict the direction of stock returns using the function runs.test(). Lets go a step further and try modelling this with a parametric econometric approach. 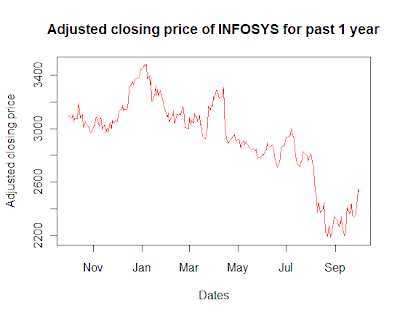 The company that I choose for the study is INFOSYS (NSE code INFY). 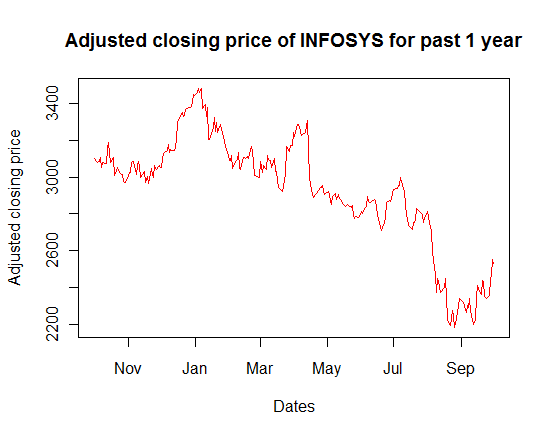 Lets start by eyeballing the plot of the stock prices of INFY for the past one year. # Reading the relevant file. Eyeballing the above plot suggests that the series is NOT second order stationary. Meaning that the first two moments, of the distribution from which the data is drawn, changes with time. For a stationary series, the mean doesn't changes with time and the co-variance with any "k" lag is independent of "t" and it just a function of "k". But we see that both the conditions are violated above. Let me attempt to explain the idea stationary in simple English language. For a moment suppose that you were to stand at time T = t and look at the value of the series, then look at the neighbors values to the left and right of "t", if by doing this exercise you can make out the value of "t" that you are standing at then it is possibly a non-stationary series. On the other hand if you were placed at time T = t in any stationary series, by doing the above exercise you would not be able to figure out the value of "t". (This definition came up during a discussion with Utkarsh some time ago). A rule of thumb in any time series modelling is that we work with only stationary time series. If the series exhibits any non-stationarity, we have to remove that before we can employ any empirical analysis. In the above series the non-stationarity can be removed by using the returns instead of actual stock prices. (analogous to First differencing) . We see that in the above plot the mean is fixed at 0 and the fluctuations are around that mean, that doesn't change with time. Now that we have taken care of the non-stationarity lets proceed on our task. 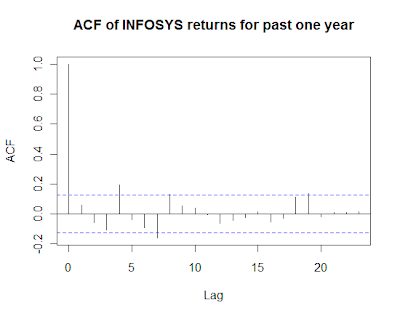 First we will plot the auto-correlation of the returns with the previous lags and see if there is any significant correlation that the returns have with the previous values. The blue dotted line is the 95% confidence interval. We can see that there is the 4th and the 7th lag significant in the ACF plot (there is one significant at 19th lag too but I choose to ignore that). Now lets see what I get if I regress the value of returns on the lagged values till lag 8th. summary(lm(infy_ret[8:length(infy_ret)] ~ infy_ret[8:length(infy_ret) - 1] + infy_ret[8:length(infy_ret) - 2]+ infy_ret[8:length(infy_ret) - 3] + infy_ret[8:length(infy_ret) - 4] + infy_ret[8:length(infy_ret) - 5] + infy_ret[8:length(infy_ret) - 6] +infy_ret[8:length(infy_ret) - 7] ))## This is a simple OLS regression of the "inty_ret" starting from the 8th observation. I have started from the 8th observation to ensure that the number of obs. are same in the dependents and independent variables. infy_ret[8:length(infy_ret) - 7] -0.12395    0.06621  -1.872  0.06241 . Only the coefficient of the 4th lag is statistically significant, and the Adjusted R-squared is a small 0.05998 (i.e ~ 6% of the explanation is provided by the above regression). In the previous post we had reached the conclusion that the returns series is completely random (using runs.test()). But here we have fit in a model that provides ~ 6% of the explanation, the important question that needs to be addressed now is that the can we use this model to predict the stock returns (and make some money using a trading strategy that employs the above regression). The model suggests that there is a statistically significant explanation that is being offered by the 4th lag in the above regression, but is this explanation economically significant? Now is when the economic intuition comes into play. The given sample data for the stock prices of INFY for the paste one year has confessed that the 4 days ago stock price provides a statistically significant explanation of today's stock prices. But a major point, perhaps the most important, that we are missing in the above model is the transaction costs or market micro-structures. Meaning that a statistically significant 4th lag does not mean that the explanation offered is economically significant too. To check if the relation is economically significant, we will have to adjust the prices for transaction costs and then do the regression and see if we get a similar result. Efficient market hypothesis that this statistical significant will disappear once you account for these transaction costs (impact cost or cost of trading). It seems to be intuitive too, because if we look at the ACF plotted above the auto-correlations are not significantly different from 0 and once we account for the transaction costs the 95% band will also broaden. P.S. In case anyone wishes to replicate the exercise the data can be obtained from here. 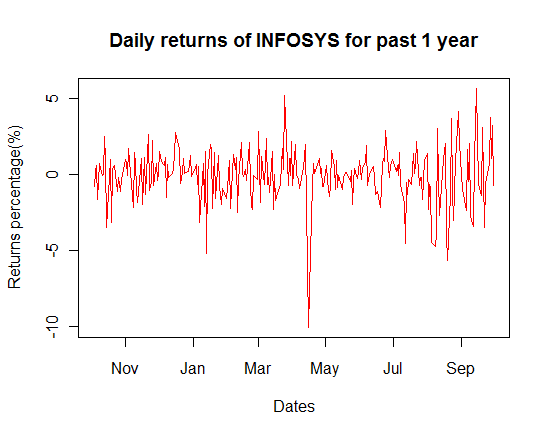 Excellent post, the notion of Second order stationarity is indeed very important in Time series analysis. However, would it not be more natural to fit an ARMA model instead of a regression model to the data, considering that it is indeed a time-series? I tried to keep this post as simple as possible, maybe in the following posts I would elaborate more about ARMA modelling. But yes no doubt an ARMA modelling here would have been a better technique. I am waiting for your post on ARMA. Would be really helpful if you can post it. Hi, I am trying to replicate an output for this with my own data however, I do not know why it is not populating. I have a one column data that I produced an Auto correlations graph like yours above. I would like to calculate the Rsqrd and the pvalue however, when I copied your code and exchanged infy_ret for my own variable "variable1", it did not produce the same output. Please provide guidance if possible. Thanks! Can you provide the codes and data that you are using to generate the output? why there is INFY.BO and not INFY in symbol. is it required .BO in all stocks?